Whether you have a curved staircase, a straight run, or stairs with a landing between floors, United Elevator Services has the right product for your home. From stair chairs that swivel to standing platforms, we can assist you with navigating your home safely. Our units are designed to take up minimum space and not detract from the beauty of your home. Our expert installers can do most jobs in one day. Best of all, we will not provide a quote without a free in-home consultation from a member of our sales team. Contact Angela Long for your stairlift needs. We are pleased to feature the finest name in stair chairs, the Sterling Stairlift for your consideration. Sterling products are manufactured in England and provide the smoothest and most comfortable ride available. 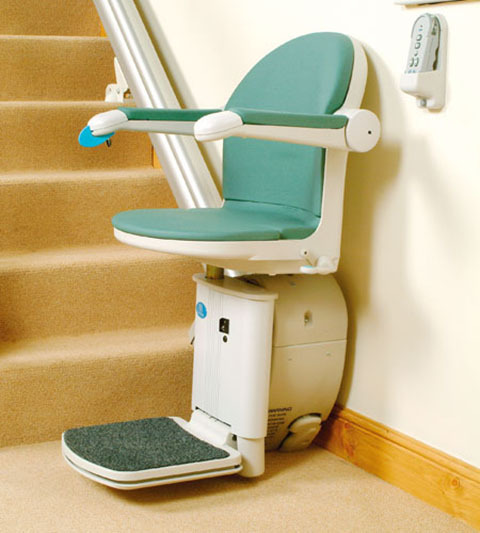 Sterling Stairlifts have indoor as well as outdoor units and can be made to fit any set of stairs for any home. Doorway issues? Concerned about tripping hazards? Don’t be. Sterling Lifts can be made with an automatic folding track that folds back out of the way when not in use. Lifts come with battery operation that charges at both the top and bottom of the stairs so there is no need to feel trapped in a power outage. For those who are more cost-conscious and who have a simple straight or curved staircase, we also offer the Acorn Stairlift. An Acorn Lift will also provide you with a safe, comfortable ride. It has wireless remote operation and comes battery operated for safety and convenience. With over 100,000 units sold worldwide, Acorn gives you the quality and durability you require.